You might think that by virtue of living on planet Earth, we are experts on it. But what you, and the rest of science, doesn’t know would fill a pretty big damn book. We need to look at the bigger picture, but that is tough when you’re battling gravity with combustion engines. Luckily, Boeing’s Aurora Flight Sciences’ new plane is the answer to many climate scientist’s woes. The plane is called Odysseus, after the Greek hero who spent years wandering the world trying to get back home, which is a fitting name for a plane that could potentially spent months or perhaps even longer in the air. 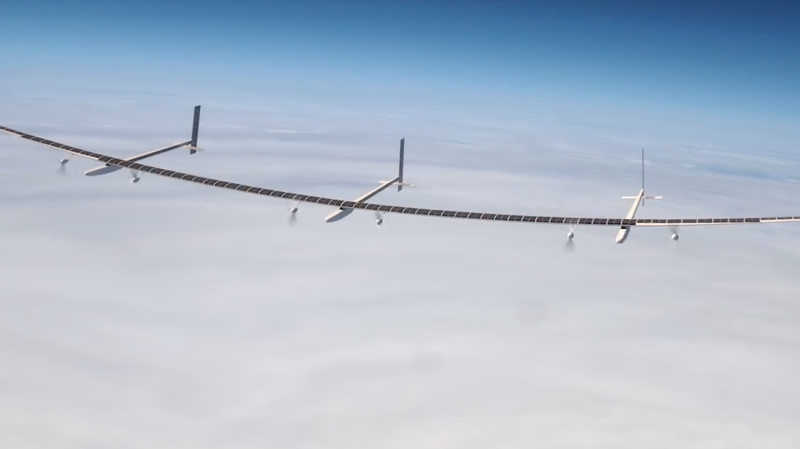 Aurora categorizes Odysseus as a high-altitude pseudo-satellite (an idea which has been around a while), but speaks about it very much in plane terms. The structure of the airplane is mostly carbon fiber trusses covered in an ultraviolet light-resistant material called Tedlar, along with ultra-low weight solar panels on the wings and fuselage. It can hold position over a certain area and stay aloft indefinitely, since its fuel is shining down on it for free, and that ability could help scientists monitor one spot on the globe for long periods of time at a fraction of the cost of launching a satellite. It’s especially useful to climate scientists, as they monitor changes over vast areas of the planet over long periods of time. Odysseus will not only give scientists a wider view, but is able to monitor changes from soil moisture on the Earth all the way to gases in the high atmosphere. While Boeing didn’t announce a price for the new ultra light aircraft, the company says it is significantly lower than the cost of launching a satellite. That, by the way, will run you a cool $400 to $500 million according to Globalcom. No wonder they’re looking for something cheaper. Odysseus is just the latest in a long line of developments in solar powered drone technology. You can trace its technology back to the wonderfully-named MacCready Gossamer Penguin, a human-powered plane which flew at NASA’s Dryden Flight Research Center in 1980. The Penguin was developed by AeroVironment, Inc,—the same company that worked on developing unmanned solar aircraft for NASA’s Pathfinder, Centurion and Helios prototype missions. Each prototype was an improvement on last, staying aloft longer, flying higher and gathering more data than the plane before it. On August 13, 2001 Helios reach 96,864 feet—a world record for sustained horizontal flight by a winged aircraft. Being highly experimental, however, the planes didn’t always last long. On June 26, 2003 Helios broke up over the Pacific Ocean during preparations for an endurance test. AeroVironment has gone from charmingly named aircraft powered by the sun to developing military drones with Lockheed Martin in recent years. I can’t get over the staying in the air indefinitely part. Thanks to those solar panels down its back, and a bank of batteries that store charge and run the motors at night, this plane can stay in the air, forever. As long as nothing malfunctions or wears out (which, of course, it will eventually) this plane will stay in the sky, quietly watching over the Earth and all the horrible things we’re dong to it. Hopefully, Aurora didn’t program this thing with AI, nuclear codes and a directive to “protect life” or we’re all screwed.